Sleek packaging, divine scents and textures, no-fuss hard working formulas and refined products that will win over any gentleman looking to feel his best. Whether you’re looking to restock your vanity cabinets or to address specific concerns, we’ve handpicked several items, fit to elevate one’s Spring/Summer beauty routine. The third olfactive iteration from the chicest French house is bound to become iconic and a cult favourite! An elegant experience in the bottle as it is on the skin, enticing from the very first glance, Bleu de Chanel Parfum caters to poised individuals & self-possessed trailblazers who march to their own beat. Meant to embody the epitome of serene intensity, akin to its dark and elegant glass bottle, this fragrance is delightfully refreshing, even though it is the most powerful of all three Bleu de Chanel fragrances. The dance of cedar and lush Sandalwood from New Caledonia add to the floral and woody composition, thanks to a pronounced accord of creamy Sandalwood. Its beautiful sillage is long-lasting and strikingly fresh, with a beautiful presence. It is resolutely a warmer and richer take on the renowned Eau de Parfum, and is immaculately balanced. A magnetic cap embossed with the infamous Chanel insignia makes sure to line up the logo to a T each and every time. A distinct sign of luxury. Available at Chanel beauty counters across Canada. Non chalky or greasy, fragrance-free (so it won’t interfere with your precious fragrance) and more importantly, 100% non-chemical. This lightweight formula is entirely translucent once applied to the skin- therefore, ideal for all outdoor activities. Super sleek and caters to a variety of skin tones. Available everywhere Clinique is sold across Canada and clinique.ca. A cool brand originating from New Zealand and the fruit of a former cricket player, Triump & Disaster’s old fashioned shave cream is actually an award-winning beauty product. Engineered with nature and infused with ingenious ingredients such as Ponga fern extract blended with Australian clay, Mexican Jojoba extract and Polynesian Tamanu oil, this line is entirely paraben free, silicone-free, and cruelty-free to boot. We are excessively fond of its heady notes (think hints of marjoram, orange & patchouli). Simultaneously soothing and invigorating, this satisfyingly rich lather makes for a blissful daily morning ritual. Available online at fendrihan.ca. Liquid gold to achy, tired eyes. A super fresh gel formula that aims to treat the delicate eye area and give an instant lift altogether. MAX LS is a premium age prevention skin care line that promotes natural repair and delivers serious anti-gravity benefits, minimizes fine lines and supports natural collagen production as well. Should be used twice daily and applied to the upper lid as well! Suitable for the most sensitive eyes. Available at Hudson’s Bay and labseries.com. Thinning hair and a loss of volume is every man’s #1 concern, in terms of capillary issues. Yet very few are aware of the pioneer of healthy strands hair care line of products designed especially for men! Bain Intra Force Densifying is a daily shampoo that aims to reinforce hair mass and texturize it even more, for as much volume as possible. This thickening effect shampoo works by fighting oxidation which causes hair loss thanks it its 2- aminoethanesulfonic acid, Taurine. Taurine is a compound that can be found in animal tissue and has several vital functions in humans. One of its noted benefits includes promoting hair growth and survival, according to several clinical observations. It also allows better stress recovery (say, after a particularly stressful few months at work, pre-wedding beauty routine, etc). Available at select hair salons and online here. A line that originally started out in 2011 as a barbershop in Vancouver’s Gastown neighbourhood, the Canadian grooming line now comprises of several stores and barber prescribed grooming essentials for the modern man.There’s several reasons why we’re fond of this brand. The scent perhaps, reminiscent of essential oils and aromas that remind us of a classic London dry gin (such as with the Classic Pomade and its aromas of juniper berry and lime peel). Or is it the fact that every product is handcrafted in Vancouver? Or is it the fact that their pomades and waxes are a force to be reckoned with, or is it perhaps because of their ethical ways of sourcing ingredients and their sustainable practices? The facial hair aficionado should cask his eyes on the whiskers tamer: a Beard Balm and a Whisker Wax delightfully scented with sage leaf and cedarwood. The Matte Pomade is infused with bergamot rind and rosemary leaf, non-sticky, and holds every strand firmly in place. Good to know: the brand focuses on three distinct grooming systems; hair, shave, and beard care. Available to purchase through www.barberandco.com, in any of their six barbershops located in Vancouver and Toronto, or at select retailers. An ebony ceramic bowl, in the purest barbershop tradition, coupled to a cruelty-free horsehair luxe badger brush. The Montreal entrepreneurs behind the rapidly expanding line have tongues wagging and for cause: their line is free of Vaseline, artificial scents, parabens, bleaching and the likes. They cherish and opt for the best natural essences and ingredients, while crafting small batches in order to ensure maximum freshness and quality. We’re especially fond of their newest grooming line of accessories such as that dramatic yet super cool shaving porcelain bowl, developed with ceramist artist Hugo Didier. Available via lesindustriesgroom.com. This eau de toilette is sure to spruce up any gentleman’s bathroom cabinet! Synonym of Italian tradition, prestige and hand-crafted perfumes, Acqua di Parma’s timeless fragrances are legendary around the world. 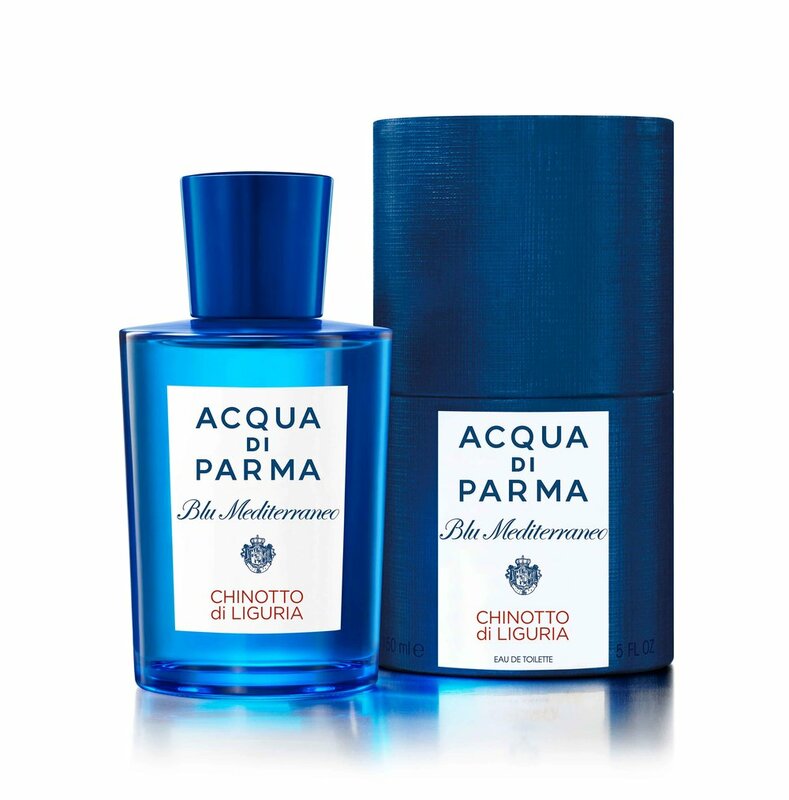 Part of the collection Blu Meditteraneo, an ode to the Italian lifestyle & resort chic flair, this new eau de toilette blends sparkling, joyful notes of chinotto, a rare fruit from Liguria used in bitters and traditional Italian cake recipes, along with mandarin. The heart notes, aka the foundation of a fragrance, include classic geranium (irresistible) but also jasmin, cardamom and rosemary. Patchouli and musk line-up the base. A lovely long-lasting bouquet. Like a breath of fresh air after a day spent at the beach, listening to the waves crash and the warm breeze gently caressing your skin… This is what basking in the beauty of the coastal villages of Italy, sipping on a Sotto Chinotto (gin, lime juice, basil, bubbly) as the sun sets upon Liguria, aka the Italian Riviera, must feel like: excessively alluring. Available at Holt Renfrew, Saks and Nordstrom.